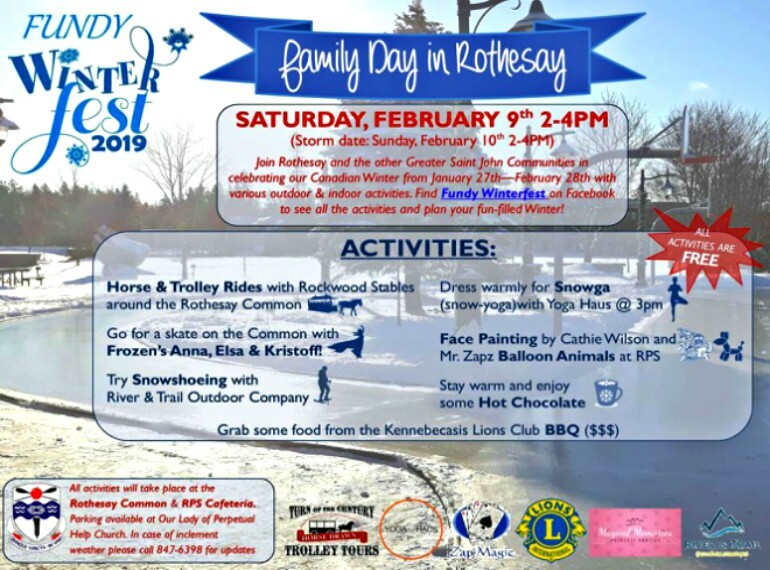 On Saturday, February 9th, 2019 (Storm Date Sunday, February 10th, 2019), join the Town of Rothesay and other Greater Saint John Communities in celebrating our Canadian Winter from January 27th to February 28th with various outdoor and indoor activities. Find Fundy Winterfest on Facebook to see all the activities and plan your fun filled Winter! The following activities are FREE admission and are going to be taking place at various Rothesay venues. Go for a skate on the Rothesay Common with Go for a skate on the Rothesay Common with Frozen’s Anna, Elsa and Kristoff of Magical Memories Princess Parties! Dress warmly for Snowga (Snow-Yoga) with Yoga Haus at 3:00 pm. All of these activities will take place at the Rothesay Common, 6 Church Avenue, Rothesay, New Brunswick and RPS (Rothesay Park School) Cafeteria, 7 Hampton Road, Rothesay, New Brunswick. Parking will be available at the parking lot of Our Lady of Perpetual Help Roman Catholic Church, 31 Gondola Point Road / 74 Almon Lane, Rothesay, New Brunswick. Find the event on Facebook and on Saint John Online Community Events Calendar!